Shaklee Vivix is the most powerful, most potent, and the most pure natural resveratrol anti-aging supplement on the market today. In laboratory studies, the ingredients in Vivix have been shown to positively impact the four key mechanisms of cellular aging. 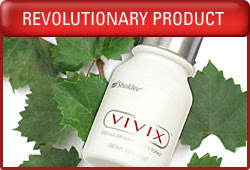 With so many resveratrol supplements on the market, why should you choose Vivix over all others? Why is Vivix better than all other resveratrol supplements or products on the market? Dr. Stephen Chaney, a professor of biochemistry and nutrition at University of North Carolina - Chapel Hill has his name on over 80 published studies in scientific and medical peer-reviewed journals and he teaches nutrition to medical students. "...The answer to that question is really three-fold. Harvard University's studies were a shock to many scientists in the resveratol community. They showed convincingly that the amounts of resveratol one needs for a substantial beneficial effect were of magnitudes greater than anyone expected. Clearly, one or two glasses of red wine per day won't do the trick. Similarly, many of the older resveratrol supplements on the market just aren't potent enough to be of any significant benefit. For those resveratrol supplements that are potent enough, many aren't pure enough. There is a naturally occurring contaminant in impure resveratrol preparations that has a laxative effect. Unless the resveratrol preparation is 98% pure or better, many people will find that the side effects outweigh beneficial effects. significant amounts in red wine or most resveratrol preparations. other components of the polyphenol blend that Shaklee uses prevent a variety of other tumors. The bottom line is that by adding a polyphenol blend containing ellagic acid and other protective polyphenols from the muscadine grape to their ultra-pure, ultra-potent resveratrol, Shaklee has developed a product that is clearly superior to either resveratrol or a muscadine polyphenol blend alone. This is not a "one plus one" addition, but a synergistic combination of protective polyphenols that is far more protective than any one of them alone..."
Vivix anti-cellular aging, created by the Shaklee Corporation, is a revolutionary, patent-pending, powerful breakthrough dietary supplement in the fight against cellular aging. A 30-day supply of Vivix delivers the equivalent amount of resveratrol found in 3,000 glasses of red wine. One teaspoon delivers the equivalent amount of resveratrol found in 100 glasses of red wine. One of the key ingredients (resveratrol) in Vivix is referenced in over 2,000 research publications, including multiple studies conducted by Harvard University, the National Institutes of Aging, and the National Institute of Environmental Health Sciences. Vivix delivers 100 mg of resveratrol per serving (One teaspoon). The resveratrol extract has a natural resveratol content of 98%. This is definitely the world's best anti-aging supplement. Shaklee is the number one natural nutrition company in the United States. For over 50 years, Shaklee has been a leading provider of premium quality natural nutrition and personal care products, environmentally-friendly cleaning products, and state-of-the-art air and water treatment systems. With a robust product portfolio, including over 50 patents and patents pending worldwide, Shaklee has more than 750,000 Members and Distributors worldwide. * Disclaimer...These statements have not been evaluated by the Food and Drug Administration. These products are not intended to diagnose, treat, cure, or prevent any disease. How did Shaklee create Vivix? Shaklee created and isolated a unique, patent pending, polyphenol blend that fights cellular aging. They were able to secure the entire output from the largest and best growers in the world. Their research found an amazing super grape, Vitis rotundifolia, which is the only grape found in nature with an extra chromosome. This alone, scientists believe, greatly enhances its polyphenol profile and health benefits. Shaklee scientists created an extraction process that resulted in a super grape extract that's high in ellagic acid, which is resposible for many cellular anti-aging actions of the super grape in the Vivix resveratrol supplement formulation. 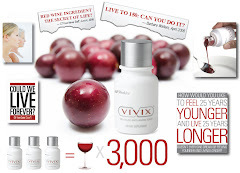 Vivix is the combination of the most powerful super grape found in nature and the ultra-pure, natural resveratrol. This anti-aging dietary supplement is all natural with no artificial colors, flavors, sweetners or preservatives. What is a muscadine grape and why is it so special? The muscadine grape (Vitis rotundifolia) is a super grape and the only grape with an extra chromosome. It is native to the southeastern United States. The muscadine grapes range from bronze to dark purple to black in color when ripe. They contain high concentrations of resveratrol - a polyphenol with reported beneficial health effects. Red wine produced from these grapes may contain more than 40 mg/L of resveratol. They are high in other nutrients as well. Can I benefit from using Vivix? Yes. Vivix will benefit adults who are concerned about cellular aging and well-being. This anti-aging tonic can also benefit anyone who is committed to being healthy and feeling great every day. Vivix is not intended for children. Is Vivix a juice beverage? "I take Tahitian Noni Juice...How does Vivix compare?" Vivix is not a juice beverage. It is an exclusive, concentrated liquid anti-aging dietary supplement that delivers the purest form of resveratol and a highly potent polyphenol extract created from the only grape in nature with an extra chromosome. This unique blend of polyphenols includes ingredients that have been shown in laboratory studies to fight key mechanisms of cellular aging. One teaspoon of Vivix delivers the equivalent amount of resveratrol found in 100 glasses of red wine. When I buy my supply of Vivix, how should I take it? You should take the recommended serving of one teaspoon a day, preferably with breakfast or lunch. Make sure you shake well before use and keep both unopened and opened bottles refrigerated for optimal freshness and quality. Fortune - "Resveratrol is the ingredient in red wine that made headlines in November when scientists demonstrated that it kept overfed mice from gaining weight, turned them into the equivalent of Olympic marathoners, and seemed to slow down their aging process. Few medical discoveries have generated so much instant buzz..."
WebMD - "Resveratrol may prolong life and fight age-related diseases. Resveratrol is one of a group of antioxidant compounds called polyphenols found in red wine that has been reported to have anti-inflammatory as well as anticancer poperties. Resveratrol may counter type 2 diabetes and insulin resistance, a new study shows..."
CNN - "This research, funded in part by the National Institute on Aging, was published in the journals Nature and Cell inNovember. Dr. Brent Bauer, Director of Internal Medicine's Complimentary and Integrative Medicine Program at Mayo Clinic says, 'This may be the best thing since sliced bread for human beings, but we just don't know yet...' "